With the complex adding systems that we have today, it can be hard to grasp that peoples were using small stones or other objects as numerical devices from time immemorial. The word calculate itself comes from the Latin calculus, which means small stone. These methods of calculations introduced some elementary kind of abstraction, but people gradually realized that this method did not go far enough to satisfy their increasing needs. To count up to 1000, for example, they would have had to gather a thousand pebbles, which was enormous work. That is why, once the principle of the numerical base had been grasped, the usual pebbles were replaced with stones of various sizes to which different orders of units were assigned. For example, if a decimal system was used, the number 1 could be represented by a small stone, 10 by a larger one, 100 by a still larger one, and so on. It was a matter of time someone to think of to arrange some pebbles over a big flat base stone, wire or something else. It is unknown when exactly were developed first devices to facilitate calculation, such as the counting board, or abacus. The counting board was invented when someone grasped the idea of placing pebbles or other objects in columns marked on a flat surface, and assigning an order of units to the objects in each column. Later, loose objects in columns were replaced with beads that could slide along parallel rods. There is an unproved information, that similar to abacus device was used in Babylonia as early as 2400 BC. The word abacus itself is a Latin word, which comes from Greek άβακασ (board or table). The Greek word probably comes from the Semitic abk, which means sand, dust or to wipe the dust, which can suggest to us, that Greeks accepted the idea of abacus from the Phoenicians (which is the case with the Greek alphabet, inspired by the Phoenician alphabet). Actually the Romans applied the word abacus (and also the word calculi, which comes from calculus (stone, pebble) to various objects, all with the common characteristic of having a flat surface: tables used in different kinds of games, sideboards and the calculating device still known as the abacus. The Greeks used besides the above-mentioned type of abacus, also so called dust abacus—a box, full of sand (or dust), divided into columns, over which can be arranged pebbles or other small objects. The first written information about the abacus, survived to the present, is from the Greek historian Herodotus (480-425 B.C. ), who mentioned also, that the ancient Egyptians used abacus. The oldest abacus, survived to the present day, is so called Salamis abacus (see the nearby figure). It was named after the greek island of Salamis, in the vicinity of which it was found in 1846 and was described later by the Greek archaeologist Alexander Rizo-Rangabe. 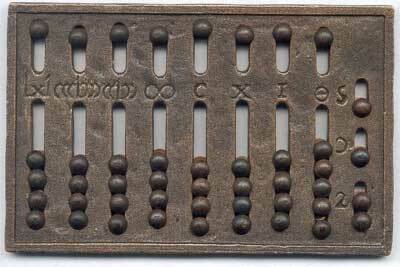 The Salamis abacus (kept now in Epigraphical Museum of Athens) is dated around 300 B.C. and is a large slab of white marble (broken in half now), 149 cm long and 75 cm wide, with five parallel lines engraved into it and, below them, eleven parallel lines divided in half by a perpendicular line. The third, sixth, and ninth of these eleven lines are marked by crosses at their points of intersection with the perpendicular line. Three nearly identical series of Greek characters, which are numerical signs for noting sums of money in the greek monetary system (the basic unit is drachma, but there are also 2 smaller units—obols and khalkoses, and 2 bigger, which actually were never minted—minas and talents), are engraved on three sides of the slab. The four columns on the top, were used for fractions of the drachma, the first one corresponding to khalkoses (1/48 of a drachma), the second to quarter-obols (1/24 of a drachma), the third to half-obols (1/12 of a drachma), and the fourth to obols (1/6 of a drachma). The next five columns were associated with multiples of the drachma: the first on the right corresponded to units, the second to tens, the third to hundreds, and so on. The last five columns (in the bottom part) were respectively associated with talents, tens of talents, hundreds, and so on. Since a talent was equivalent to 6000 drachmas, counters representing 6000 drachmas were replaced with one counter in the talents column. By means of these different divisions, the reckoner could perform addition, subtraction, and multiplication. There is also another interesting old Greek artifact, the so called Darius Vase, dated about 500 B.C., in the museum at Naples, which contains a picture of a abacus-like instrument (see the drawing below). Pictures (but not an artifact yet) of a Roman table abacus were found on an Etruscan cameo, on a Roman pier and on a relief of the Capitoline Museum in Rome. The Roman abacus was similar to the greek one (see the upper photo). It consisted of a small metal tablet with parallel grooves, usually nine of them, each corresponding to an order of units, in which spherical counters slid. 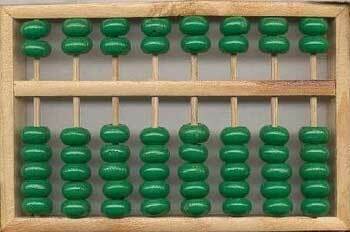 The abacus in the upper figure has 8 decimal positions (leftmost), for the units, tens, hundreds and so on to the 100 millions (marked with I, X, C...). When the units of a certain order did not go beyond four, the reckoner indicated them in the corresponding lower groove by pushing up as many counters as necessary. When they reached or went beyond five, he first pushed down the counter in the upper groove (representing five units in the order of that groove), then pushed up as many counters as necessary in the lower groove. The ninth position from the left (marked with O) has an upper part containing one counter and a lower part containing five. It served to indicate multiples of an ounce, each lower counter representing one ounce and the upper counter six ounces. The rightmost groove is divided into 3 parts and is used to indicate a half-ounce, a quarter-ounce, and a duella, or third of an ounce. 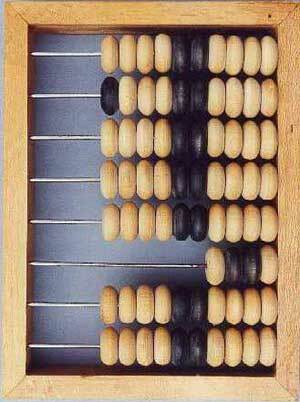 During the so called Dark Ages in Western Europe the art of counting with abacus was more or less forgotten. One of the first scientists, which not only popularized the Hindu-Arabic digits, but also reintroduced the abacus, was (surprise!) 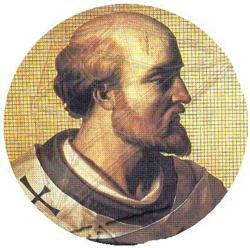 Gerbert d'Aurillac (c. 946-1003), archbishop of Rheims and chancellor of France, well-known as Pope Sylvester II (see the nearby image). Gerbert lived some time in Spain and took the idea of the abacus from Spanish Arabs (in 967, he went to Catalonia to visit the Count of Barcelona, and remained three years in the monastery of Vic, which, like all Catalans Monasteries, contained manuscripts from the Muslim Spain and especially from Cordoba, one of the intellectual centres of Europe at that time). The abacus that Gerbert reintroduced into Europe had its length divided into 27 parts with 9 number jetons, so called apices (this would exclude zero, which was represented by an empty column) and 1000 apices in all, crafted out of animal horn by a shieldmaker of Rheims. For example, with the Gerbert's abacus, the number 308 will be expressed with a apex for 3 in the hundreds column and with a apex for 8 in the column of units. According to his pupil Richer, Gerbert could perform speedy calculations with his abacus, that were extremely difficult for people in his day to think through in using only Roman numerals, that was one of the reasons Gerbert to be suspected as a magician and servant of the Devil:-) Due to Gerbert's reintroduction, the abacus became widely used in Western Europe once again during the 11th century. The first printed book on arithmetic and the operation of the abacus in Europe was the anonymous Arte dell’Abbaco, (Treviso, 1478). The most popular kind of abacus still in use during the Renaissance in Europe was a table on which lines marked off the different decimal orders (so called reckoning table). The pebbles previously used as counters have been replaced by specially minted coin-like objects (like apices, introduced by Gerbert) that are cast, thrown, or pushed on the abacus table. They are called jetons from jeter (to throw) in France, and werpgeld for “thrown money” in Holland. All administrations, merchants, bankers, lords, and rulers had reckoning tables with counters bearing their own marks, made of base metal, gold, or silver, depending on their rank or social position. The value of a counter depended on its position. On consecutive lines, going from bottom to top, it was worth 1, 10, 100, 1000, and so on. Between two consecutive lines, it was worth five units of the line immediately below it. Addition was done in the left (or forward) part of the frame, by placing counters corresponding to the numbers involved, then reducing them and taking account of the value assigned to each location. To multiply two numbers, the reckoner began by representing the first one in the left part of the frame, then he eliminated one by one the counters representing this number as he replaced them in the right (or rear) part of the frame with their products by the second number. Computation on the reckoning table was taught till the eighteenth century. The fact that it was discussed in many European arithmetic books in the sixteenth, seventeenth, and eighteenth centuries gives an idea of how common it was. It was so firmly anchored in European tradition, that even when written computation with Hindu-Arabic numerals was becoming general, results obtained in that way were always checked on a reckoning table, just to be sure. The reckoning table made addition and subtraction easy, but for more complex operations it was slow and required long training. 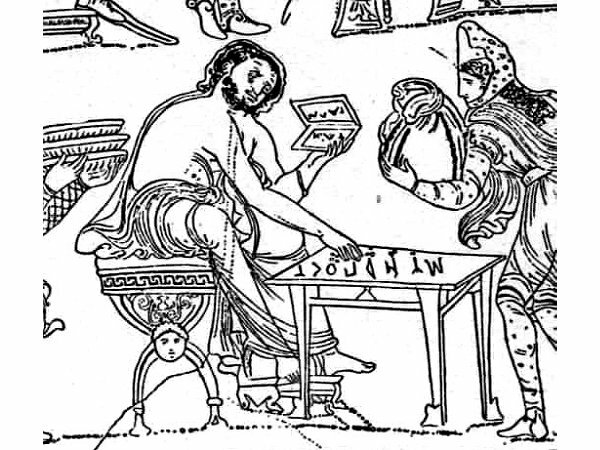 This drawback must have been what prompted the fierce controversy that began early in the sixteenth century between the abacists, who clung to the reckoning table and the archaic Greek and Roman numerations, and the algorists, who advocated a form of written computation (see the lower figure). Written computation was quickly adopted by the scientists (especially by mathematicians and astronomers), while the reckoning table continued to be used in business and finance. Typus Arithmeticae, woodcut from the book Margarita Philosophica, by Gregor Reisch, Freiburg, 1503. 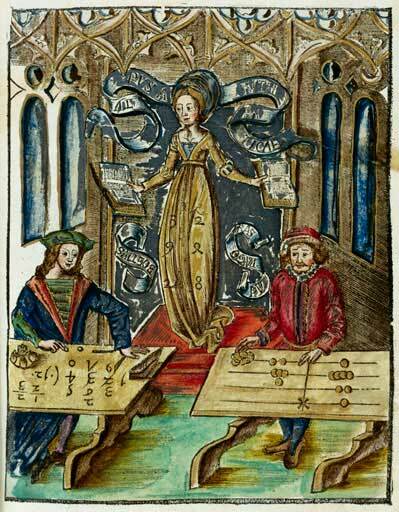 The central figure is Dame Arithmetic, watching a competition between Boethius, using pen and Hindu-Arabic numerals, and Pythagoras, using the counting board. She looks toward Boethius, which obviously is in favor. A quite different and much more advanced form and methods for calculation can be seen in the development of abacus in Asia. 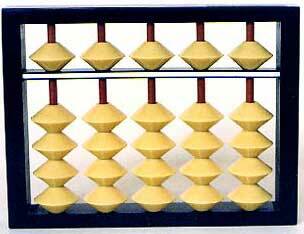 The Chinese started to use counting boards, the prototype of abacus, as early as 4th century BC. 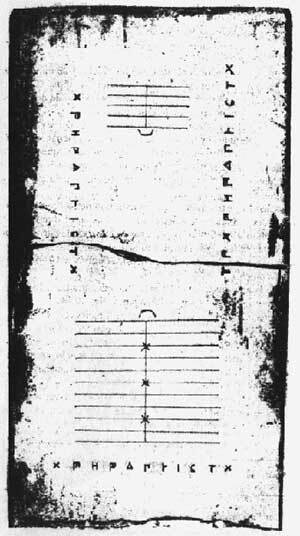 The chinese counting board was a wooden plate, divided into columns, and calculations were made by means of bamboo or ivory sticks (see the nearby figure for the 2 ways of representation of digits). In the rightmost column are denoted units, in the next—tens, and so on. Some historians even claim, that this namely was the first use of the decimal numbering system in the world. In the most famous Chinese mathematical text—Chiu chang suan shu (Nine Chapters on the Mathematical Art), which dates from the period of the Han Dynasty (206 B.C. to A.D. 220), gives details of algebraic operations on the counting board, including the solution of a system of n equations with n unknowns. The long and gradual improvement of the chinese counting board leaded to development (sometimes in 2nd century) of a more convenient type of abacus—the bead abacus, mentioned in the book of Xu Yue, Supplementary Notes on the Art of Figures, written about the year 190 A. D. The Chinese bead abacus (so called suanpan) has a rectangular wooden frame with thin rods across it. On each rod are placed seven glass or wooden beads: five (the number of fingers of a human) below the strip of wood, that divides the frame into two unequal parts, and two above it (the number of hands). The rods correspond to numerical values increasing tenfold from right to left. (Base 10 is not obligatory, of course; another base, such as 12 or 20, could be used if an adequate number of beads were placed on the rods.) If the first rod on the right corresponds to units, the second one corresponds to tens, the third to hundreds, and so on. Users of the suanpan, however, do not always begin with the first rod on the right to represent whole numbers: they sometimes begin with the third from the right, reserving the first two for centesimal and decimal fractions. Each of the five beads on the lower part of a rod has the value of one unit of the order corresponding to the rod, and each of the two beads on the upper part has the value of five units. Numbers are formed by moving beads toward the crossbar separating the upper and lower parts of the rods. To form the number four, for example, the user simply raises four beads on the lower part of the first rod on the right. For eight, he lowers one upper bead on that rod and raises three lower ones. As it can be seen, there is some kind of redundancy in the notation of numbers in suanpan. Nine units of the order corresponding to a given rod are represented by one upper bead with the value of five units and four lower beads with the value of one unit each. Five beads are thus enough to represent nine units. This raises the question of why each rod has seven beads, which allowed a total value of 15 to be entered. The reason is that in doing division on an abacus, it is often helpful to indicate, temporarily, a number greater than 9 on a single rod. For the three other operations, five beads on each rod are enough. In the case of division, however, calculation may be simplified if a partial result greater than 9 is temporarily indicated on one rod. Some time in the late 16th century the Chinese suanpan was adopted in Japan, under the name soroban. The soroban however was gradually simplified, and from the middle of the 17th century, the number of the beads in the lower part was reduced to 4, while in the upper part remained only 1 bead. This means, that the redundancy of the suanpan was removed, due to the fact, that the older Chinese division method, which makes use of the cumbersome division table, was formerly replaced by the Japanese division method, which makes use of the multiplication table. Another country, in which the bead abacus was extremely popular, apart from China and Japan, at least in recent times, it is Russia. The Russian abacus, so called русские счёты (russkie schoty) (see the nearby photo) was first mentioned in 1658, in an inventory book. The construction of schoty probably was based on the chinese suanpan, but was quite different in the design. The main difference between suanpan and schoty is the horizontal position of the rods in the schoty (so the beads are slided right-to-left), and the rods have a slight curvature to prevent the "counted" beads from accidentally sliding back to the home-position. The typical schoty have several (usually 8 to 10) decimal positions, and 1 position with 4 beads (which not only acts as a separator or for fractions, but can be also used for calculations in polushki, the russian monetary system in this time was constituted by polushki, kopeiki (1 kopeika equal to 4 polushki), and roubles (1 roubla equal to 100 kopeiki)). The Russian abacus has some improved variants, like Markov's abacus (счетьi Маркова), double abacus (двойньiе счетьi), Ezerski's abacus (счетьi Езерскаго), Kompaneiski's abacus (счетьi Компанейскаго), etc. The Russian abacus is still in common use today in shops and markets throughout the former Soviet Union, although it is no longer taught in most schools. Around 1820, the Russkie schoty was brought to Europe (first to France, under the name boulier-compteur), though not as a calculating device, but rather as a didactic tool for beginning course of arithmetic. American indians also used calculating tools. In the beginning of 1600s the Quechua nobleman Felipe Guaman Poma de Ayala wrote a letter to the King of Spain, containing 1179 pages. 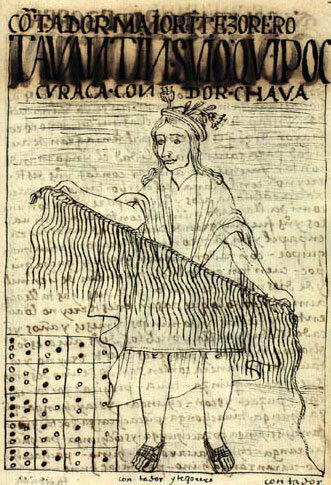 The letter includes several drawings which show quipus (recording devices used in the region of Andean South America, consisting of colored, spun, and plied thread or strings) and a picture of a counting board in the bottom left hand corner of one of them (see the lower picture). This is called the yupana and is presumed to be the counting board of the Incas. Yupana, the counting board of the Incas.